Testosterone BoostersFOURPLUS 4+ Testo+ - 120 kaps. Megabol Biosterol - 36 kaps. Biosterol is a preparation with a high content of steroid saponins intended to assist athlete's diet. FOURPLUS 4+ Testo+ - 120 kaps. Safe and effective testosterone booster designed on the basis of: Tribulus, maca, Greek hay, oats, black pepper, vitamin B6 and zinc! 178 loyalty points Your cart will total 178 points that can be converted into a voucher of 7,12 PLN. 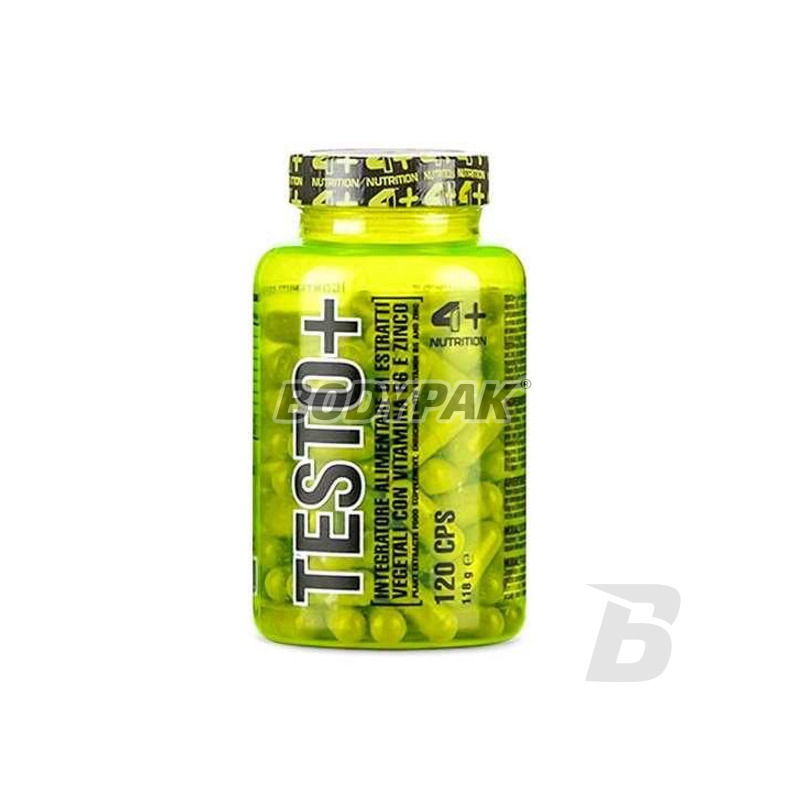 4+ Testo + - is a dietary supplement in capsules. Created on the basis of: Tribulus, maca, Greek hay, oats, black pepper, vitamin B6 and zinc. Specially prepared blend of ingredients was created to enhance the body's resistance to stress and physical and mental fatigue. INDUSTRY AND EFFECTIVE FORMULA BASED ABOUT ACTIVE SUBSTANCES TESTED! Thanks to the presence of vitamin B6 and zinc preparation ensures the smooth operation of the immune system. Vitamin B6 also acts as a regulator of hormonal activity. The product helps to maintain normal testosterone levels where there is a problem with its reduction, in the normal case makes it rises to a maximum natural level which translates into many benefits - including improved libido and sexual possibilities! Elevated testosterone levels brings many benefits such as support regenerative processes, faster gains in muscle mass, and even to improve muscle definition! Bet on the proven and fully legal ways to raise the level of this important hormone! 4+ Testo + - YOU NEED TO! 2 times a day 2 caps. Składniki: Tribulus terrestris (90% saponin); MACA (Lepidium meyenii)(ekstrakt z korzenia) standaryzowany do zawartości 2,5% beta-ekdyzonu; Fenugreek (Trigeonella feonum grecum)(ekstrakt z ziaren); Avantia sativa - ekstrakt; kwas l-askorbinowy (witamina C); tlenek cynku; substancje przeciwzbrylające (sole magnezowe kwasów tłuszczowych, dwutlenek krzemu); czarny pieprz (Piper nigrum) - ekstrakt zawierający 95% piperyny; chlorowodorek pirydoksyny (witamina B6). Olimp Erekton MAX - 8 tabl. Effective support for men with a high dose of L-arginine and the composition of the vegetable matter in the composition! The addition of zinc and selenium even stronger activity. Help yourself and enjoy a significant improvement in sexual performance! BioTech Tribooster - 60 tabl. Raise your level of natural testosterone to its maximum level. Build high-quality lean muscle mass faster and easier than ever! They also improve your libido. High quality ZMA, so that not only replenish magnesium and zinc but also be supporting the regeneration of your body and raise your testosterone levels! Well absorbed chemical forms! Universal Nutrition ANIMAL Test - 21sasz. Rise to the heights of their abilities with the concentration of natural testosterone. Do not wait until others will overtake you and reach for this product, which is characterized by the best possible action and lack of side effects. Olimp Tribusteron 60 - 120 kaps. High-quality powdered aqueous extract of Tribulus gas, which is a source of glycosides, steroid saponins, plant alkaloids, and bioflavonoids!